As a young man, McTeague (Gibson Gowland) works as a miner and doesn’t come from a wealthy family. His mother would love for him to have a better life, so when a traveling dentist comes to town, she begs him to take McTegue along as an apprentice. The dentist agrees and before long, McTeague has his own dentistry office in San Francisco. He’s not rich, but getting by and he has a good friend in Marcus (Jean Hersholt). 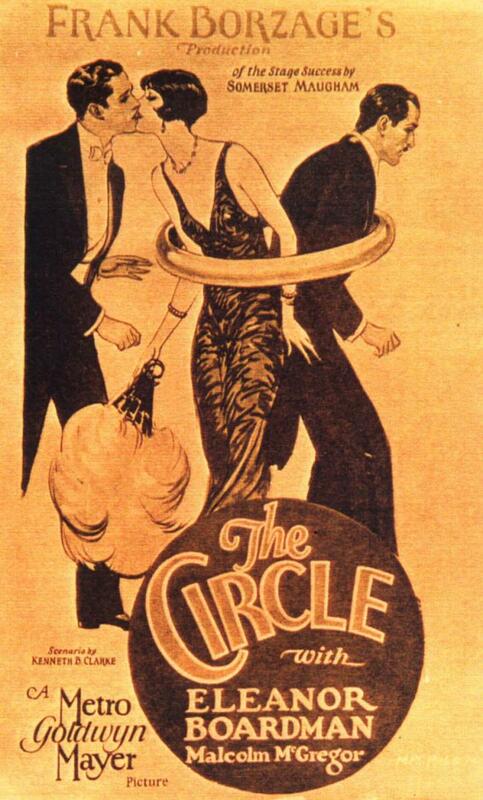 Marcus is in love with his cousin Trina (ZaSu Pitts) and he wants to marry her. But when she suddenly needs some dental work done one day, it would prove to be a fateful day for all involved. Marcus brings Trina to see McTeague and while they wait, she decides to buy a lottery ticket, not really expecting to win. When McTeague meets Trina, he falls in love with her and Marcus tries to be supportive and gives him his blessing to start courting her. It’s hard for Marcus to put his feelings aside and it gets even more difficult when they decide to get married. As difficult as that is, it gets worse when Trina finds out her lottery ticket was a winner and she’s won $5,000. Marcus becomes extremely resentful toward McTeague for not only taking Trina away from him, but for taking that money away from him, too. $5,000 is a life-altering amount of money (the movie is set around the turn of the last century) and it could do a lot to help a newlywed couple get started in life together. McTeague wants to get a small house so they can stop living in a small apartment in a boarding house, but Trina refuses to spend any of the money. She insists on doing everything as cheaply as humanly possible, even if it means living on days old meat and living in an apartment one of their neighbors was murdered in, so she can squirrel away more money that she never intends to spend. Trina’s penny pinching ways cause a lot of tension between her and McTeague and things only get worse when Marcus spitefully rats McTeague out for practicing dentistry without a license. The couple has to sell virtually all of their possessions and McTeague struggles to find more work. Trina refuses to even let him have a few cents for car fare for him to go look for work on a rainy day. Eventually, McTeague leaves town to work as a fisherman and takes $450 Trina had saved in addition to her winnings since they’ve been married. Trina is left behind absolutely furious and when she has to have some of her fingers amputated, she’s forced to become a school janitor for extra money, still unwilling to spend any of her $5,000. She even withdraws the money from the bank so McTeague can’t get to it and sleeps on it at night. When McTeague returns from his fishing excursion, he finds Trina and asks her for a little money so he can get something to eat, but she refuses. The next day, McTeague confronts Trina again, but this time he kills her in a fit of rage and takes her $5,000. Since McTeague is now a wanted criminal, he has no other choice to leave town, so he does and gets back into the mining game. But it isn’t long before begins to worry the authorities are after him. He takes a few supplies and heads into Death Valley on his own with cops following not far behind. Among the authorities is Marcus, who would love nothing more than to see McTeague brought to justice. Greed is a movie that certainly has a level of notoriety in film history. Director Erich Von Stroheim infamously spent two years filming 85 hours worth of footage for this movie. Filming the scenes in Death Valley alone took two months and Von Stroheim’s original cut of Greed was an astonishing 42 reels long (approximately 8 hours, but could be longer depending on the speed it was projected at.) Von Stroheim only screened his original cut once for about a dozen people before Irving Thalberg insisted it be cut down to a more manageable length. Von Stroheim cut it down to 24 reels and wanted it released as two separate movies, but that didn’t happen. Instead, Thalberg had it cut down to 10 reels. For years, Greed only existed in an extremely truncated form. The hours of footage that were part of Von Sternberg’s original cut are believed to be lost, but the movie has been restored to a 4-hour long version using still photos to fill in some of the missing gaps. 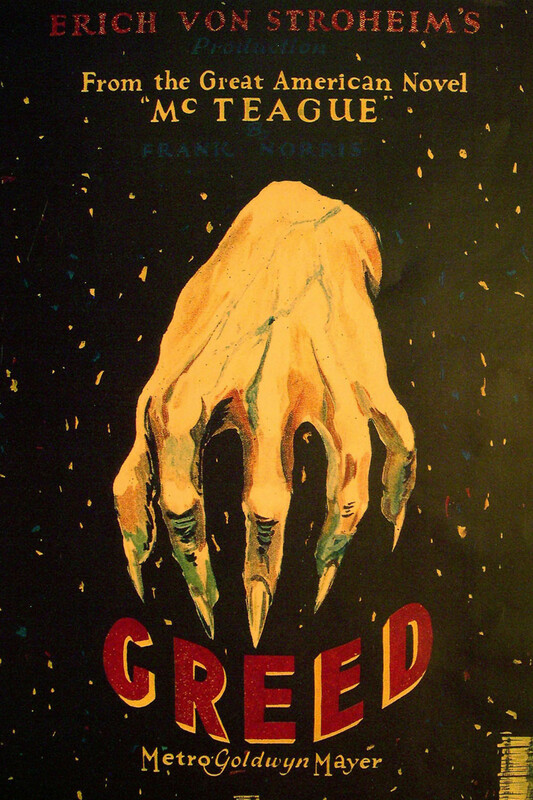 Now rightfully celebrated as being one of the finest films to be produced during the silent era, Greed was greeted to less enthusiasm after its original release. The restored version does a good job of giving us a better idea of what Von Stroheim’s original vision was. The length alone is something that will deter a lot of people from watching it and I know some people aren’t big fans of using still photos in place of lost footage, but it’s really the kind of movie every self-respecting silent film fan should watch at least once. Admittedly, I don’t have the most patience for 3+ hour long movies, but I love Greed. Since it’s been a few years since I last saw it in its entirety, I re-watched it again before writing this post and I’d almost forgotten how good it is. It may be slow paced, but it’s a very compelling look at the power greed can have over people. 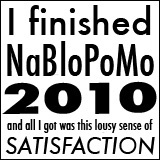 I know I would be absolutely thrilled if that lost footage ever turned up somewhere. When Arnold Cheney (Creighton Hale) was just a baby, his mother Lady Catherine (Joan Crawford as the young Catherine, Eugenie Besserer as older Catherine) leaves her husband Lord Clive (Derek Glynne as young Clive, Alec B. Francis as older Clive) to run off and elope with his friend Hugh (Frank Braidwood as young Hugh, George Fawcett as older Hugh). When Catherine leaves, she leaves baby Arnold at home to be raised by Clive. 30 years pass and Arnold hasn’t seen his mother since. Naturally, Arnold and Clive have a lot of resentment toward Catherine and Hugh. Arnold is now married to a woman named Elizabeth (Eleanor Boardman) and they live together in the big family estate, enjoying all the privileges that come with wealth. But Elizabeth is in love with Edward Lutton (Malcolm Mc Gregor) and is considering leaving Arnold for him. Since she knows the situation she’s in sounds somewhat familiar, she decides to invite Catherine and Hugh over so she can see what their relationship is like now. Arnold is very anxious about this meeting and when they arrive, things are awkward at first. But when Elizabeth sees Catherine and Hugh having a sentimental moment together, she thinks leaving her husband would be the best move. But when Arnold finds out about it, he isn’t about to give up on his marriage so easily. For some reason, I didn’t have terribly high expectations for The Circle, but I ended up liking it a lot more than I expected to. Frank Borzage directed it and did a fine job. The story has a very healthy balance of humor and drama. It’s the kind of story that might have become cheesy and cliched in less capable hands, but it worked out very well. The cast is excellent and I really enjoyed the cinematography and sets. This is the kind of movie I don’t hear mentioned too often, but it’s a real gem. On the day of her confirmation, Thymian (Lousie Brooks) is given a diary as a gift. It was also the day her life started a downward slide. She’s the daughter of a pharmacist who can never resist having affairs with the family’s housekeepers. When the latest one, Barbara, is pregnant, she’s sent away, but Thymian doesn’t know why. Barbara later commits suicide and when her body is brought back to their home, Thymian is understandably upset. That night, her father’s business partner Meinert (Fritz Rasp) comes to console her, then rapes her, which results in Thymian having a child out of wedlock. She never admits who the father is, so her family reads her diary to learn the truth. They want her to marry Meinert, but she refuses, so they take her child away from her and send her to reform school. Life in the reform school is brutal and Thymian desperately wants to get out. She gets in touch with a friend, Count Orsdoff (Andre Roanne), who has also fallen on hard times. He had been supported by a wealthy uncle, but was cut off when he fails to succeed at any subject in school. She tries to get him to talk her father into getting her out, but he’s just married Meta (Franziska Kinz), the family’s new housekeeper, and doesn’t want Thymian around. Instead, Orsdoff helps Thymian and her friend Erika (Edith Meinhard) escape. The first thing Thymian wants to do is see her child, but finds out the baby has died. With no one to take care of her and no job skills, she and Erika become prostitutes. One night, her father, Meta, and Meinert see her in a nightclub in the city and are shocked to see what’s become of her. But shortly afterward, Thymian’s father passes away, leaving her as sole heir. She stands to inherit a lot of money since Meinert is buying her father’s share of the pharmacy and she plans to use her money to start a new life. She even plans to marry Orsdoff so she can have a new identity and help Ordoff start a new life. But when she sees that Meta and her two young children have been left with no money and no place to go, she decides to give them the money because she doesn’t want the children to wind up like her. Since Ordoff now isn’t able to start over in life, he kills himself. Ordoff’s uncle feels terribly guilty for disowning him and decides to make up for it by taking care of Thymian and helping her start over. She earns a more respectable place in society and people start trying to get her involved in charities — including the reform school she was once imprisoned in. Diary of a Lost Girl really ought to have been titled Diary of a Lost Girl: Men are Terrible. Everything bad that happens to poor Thymian is the result of being forced to be around terrible men like her father, Meinert, and the super creepy warden at the reform school. This movie is definitely not short on melodrama and Louise Brooks gives a wonderful performance in it. She’s absolutely radiant and lights up a screen like few other stars ever could. Brooks greatly benefits from G.W. Pabst’s direction; they were such a great actress/director pair, like Dietrich and Von Sternberg or de Mille and Gloria Swanson. If you liked Pandora’s Box, you’ll probably also like Diary of a Lost Girl. Between Brooks’s performance and Pabst’s direction, Diary of a Lost Girl remains entertaining and compelling and stands apart from being ordinary melodrama. Posted in 1920s, Dramas, NaBloPoMo 2015, Silents and tagged G.W. Pabst, Louise Brooks on November 19, 2015 by Angela. One day, Lotus Flower (Anna May Wong) finds a man floating unconscious in the sea. She calls for help to rescue him and he’s nursed back to health. The man’s name is Allen (Kenneth Harlan), an American visiting China. As he recovers, Allen and Lotus Flower fall in love with each other and they decide to get married and Allen plans to bring Lotus Flower back to America with him. They’re both absolutely thrilled, but Allen’s friends don’t think he should bring Lotus Flower back with him and some women Lotus Flower knows are convinced he’s going to go back to America and forget all about her. Lotus Flower is really looking forward to leaving for America, but Allen succumbs to peer pressure and tells her that he can’t bring her home with him at that time. She’s absolutely heartbroken and as the months go by, she spends every day waiting to hear from him. When her son is born, she names him after Allen, despite the fact that she still hasn’t heard from him. Eventually, Allen returns to China and Lotus Flower is ecstatic. She can’t wait to introduce her son to his father. But he arrives with a guest she wasn’t expecting — his wife, Barbara (Beatrice Bentley), an old childhood acquaintance. She knew all about Lotus Flower and insisted the only honorable thing Allen could do was return and tell Lotus Flower the truth. The news is understandably devastating to Lotus Flower, who pretends her son is an American neighbor child. She later admits the truth to Barbara and insists she take the child back to America with her. If you’re a fan of early Technicolor, Toll of the Sea is one you absolutely must see. 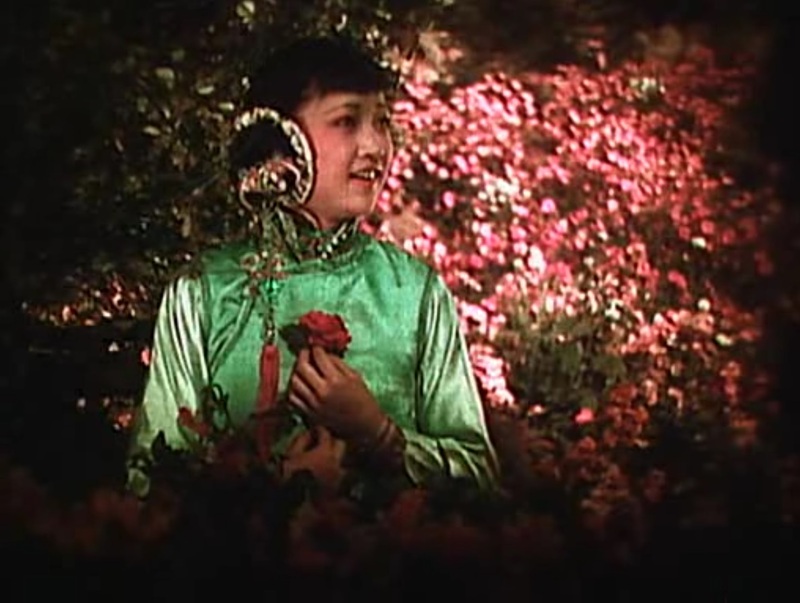 It’s one of the earliest examples of a movie filmed in color that’s known to exist. But Toll of the Sea is more than just a technological milestone, it’s a great showcase for the wonderful Anna May Wong, who was very early in her career at this point. She was still a teenager when she made this movie and her performance is very heartfelt, sensitive, and sympathetic. Given that Anna May Wong wasn’t a big star at this point, I’m impressed the producers cast a real Chinese-American actress in the lead role and not a better-known white actress in yellowface, especially since I can’t imagine this was a low-budget movie since it was filmed in color. I really wish I heard this movie being discussed more than I do, because it’s a very good little movie. Posted in 1920s, Dramas, NaBloPoMo 2015, Silents and tagged Anna May Wong, Beatrice Bentley, Kenneth Harlan on November 9, 2015 by Angela. Juan Gallardo (Rudolph Valentino) wants nothing more out of life than to be a famous matador, much to the dismay of his mother who would rather see him go into a less dangerous profession. He loves the sport and given that he doesn’t come from a wealthy family, he sees the glory that would come with being a famous matador as his way to a better life. He spends his spare time fighting in small bullfights and eventually earns a reputation for being a very talented matador. It isn’t long before he becomes quite a celebrity throughout the country. He’s living out a classic “poor boy makes good” type of story. Not only is he rich and famous now, complete with his own entourage, he also marries his virtuous sweetheart Carmen (Lila Lee) and their wedding is a grand event. It isn’t long before they start a family and have a very happy home together. Juan’s life becomes more complicated when he meets Doña Sol (Nita Naldi), a very glamorous widow. He loves Carmen very much, but the connection he has with Doña Sol is very different. She’s much vampier than Carmen and he can’t help but resist being drawn to her. They start having an affair and before long, rumors of their relationship start turning up in the gossip papers, hurting Carmen. Juan decides to end things with Doña Sol, but she isn’t about to let go so easily and tries to destroy his marriage to Carmen. In despair over what his personal life has become, Juan starts getting more careless during his fights, which eventually leads to him being fatally injured during a fight. Whether or not you’ll enjoy Blood and Sand ultimately all comes down to how accustomed you are to silent films. 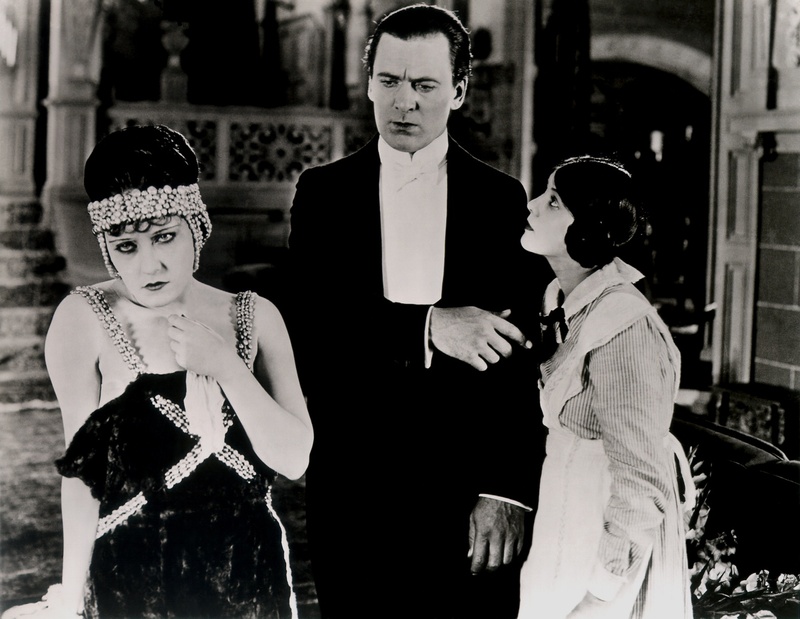 If you aren’t really familiar with silent films or the styles of acting that you’ll see in them, it might seem really creaky and overly-dramatic. But if you’re used to the style of silent films, you’ll likely enjoy it more. 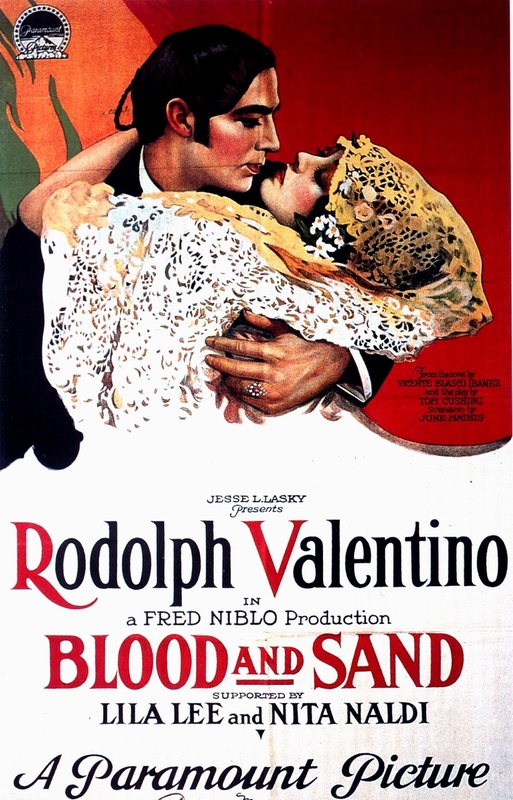 Blood and Sand was one of Rudolph Valentino’s most famous roles and although it’s not my personal favorite movie of his, I still enjoyed it. Sure, there are plenty of other movies that deal with the trials and tribulations of fame and do so much better, but it’s easy to understand why it was a big hit when it was released and still isn’t bad today. It’s definitely one of Valentino’s best roles, which makes it essential viewing for any Valentino fan; I recommend it over The Sheik. Posted in 1920s, Dramas, NaBloPoMo 2015, Silents and tagged Fred Niblo, Lila Lee, Nita Naldi, Rudolph Valentino on November 3, 2015 by Angela.